The overall objective of TR&D4 is to develop cutting-edge image analysis technologies that can integrate various anatomical representations (multi-manifold) of the brain based on multi-modal MRI that includes not only multi-contrast anatomical MRI (T1, T2, diffusion, DTI, magnetization transfer, MT, susceptibility weighted and susceptibility tensor MRI, SWI and STI) but also functional MRI (fMRI) and MR spectroscopy (MRS) into a common anatomical framework. In addition, methods are developed to monitor time dependent anatomical change for growth (brain development) and neurodegeneration. Various types of human brain multi-modal atlases being developed for quantitative anatomical characterization of neonate brains. Depending on the applications, population-averaged (linear and non-linear versions) and single-subject atlases are being tested, which include T1-weighted, T2-weighted, and DTI contrasts. 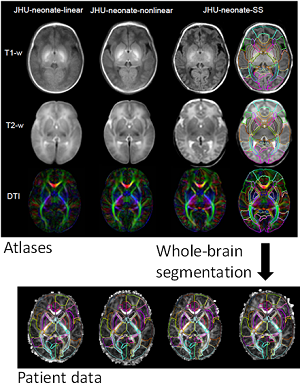 These atlases can be warped to patient images for comprehensive brain segmentation and automated quantitative reporting.